It's supposed to be similar in style to the other custom skins on arad. Happy to see new texture for the good ol' Tiger. It's different and seems to blend in with the landscape. Yea, but this camo seems to fit well with the other tanks on the map. 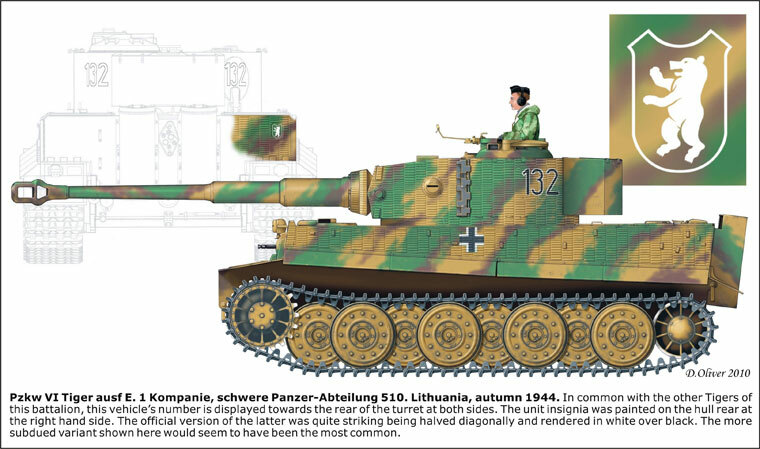 In the case of the sPzAbt.510 "large olive-green patches with brown edges on the standard yellow-olive primer", or at least if we want to believe Wolfgang Schneider. The other thing to consider is how it fits with the map. The early fall setting makes the Rotbraun & Gelbbraun really useful. And the hard edges make it not stand out from the Pz IV, Panther & Sdkfz 251 camo that's already on the map. Right. After 1943 the Germans did try to standardize the cam patterns as much as possible with the factory camouflage. Even the whitewashes on certain vehicles were factory applied, but vehicles such as Tiger I with a factory cam - or StuG III with a factory applied ambush/disc cam never existed. Looking at different camo patterns, I would not even call the pattern unusual. It really existed next to quite similar looking schemes. This particular one is from sPz.Abt. 510 in Lithuania, July 1944. Just comparing all the different patterns, you get an idea how versatile they were. There was basicly no limit, other than the base colours in 1944. It needs to do the job, that's all that matters. I guess my point is that it would be pretty difficult to create sharp, hard edged patterns using free-hand airbrush or hastily just using a brush and a broom. That's how it was done with the Tigers.